Every St. Patrick’s Day, I say this same thing, why don’t I make Irish soda bread more? 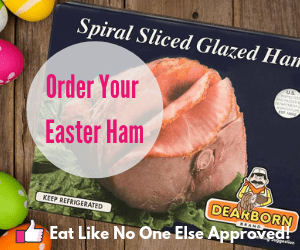 It’s delicious and super easy to make. You don’t have to wait for it to rise like yeast breads, so you can make it with even an hour notice. I have been pretty much making it the same way for years now. I use all-purpose flour and don’t include any raisins in it (not a fan of dried fruit in most breads with exception of Hot Cross Buns). This year I decided to change it up. The simplest way to do that was change the flour. I had some Jessica’s Gluten Free Flour on hand that I used to make sugar cookies for Christmas time. I have a friend that has to do gluten free, so I want to make them for her. What I found in those cookies is that they were actually better than the ones I made with all-purpose flour. So did I find the same thing when I used it for soda bread? You better believe I did! Irish soda bread is a type of quick bread. Quick breads are made without the use of yeast, so you are not waiting for them to rise before baking – thus they are quick to make. 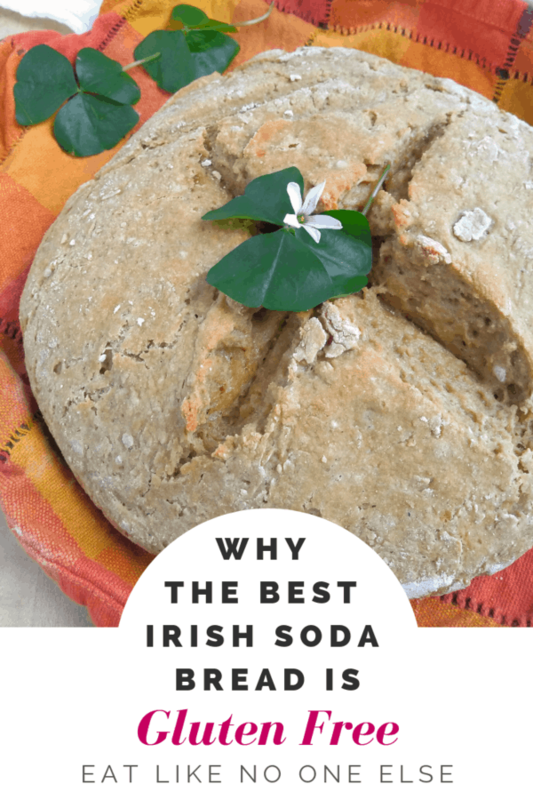 Baking soda is the leavening agent used in Irish soda bread. Good recipes call for buttermilk that contains acids that will help in the leavening process. The dough for soda bread is made via the biscuit method, where cold fat is cut into the dry ingredients before the liquid is added. 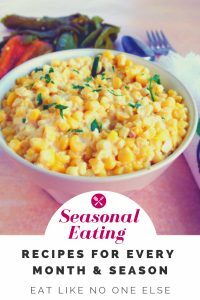 This can be done by using your fingers to rub the fat into the dry ingredients. The ingredients for soda bread are pretty simple! Not picture – cane sugar. 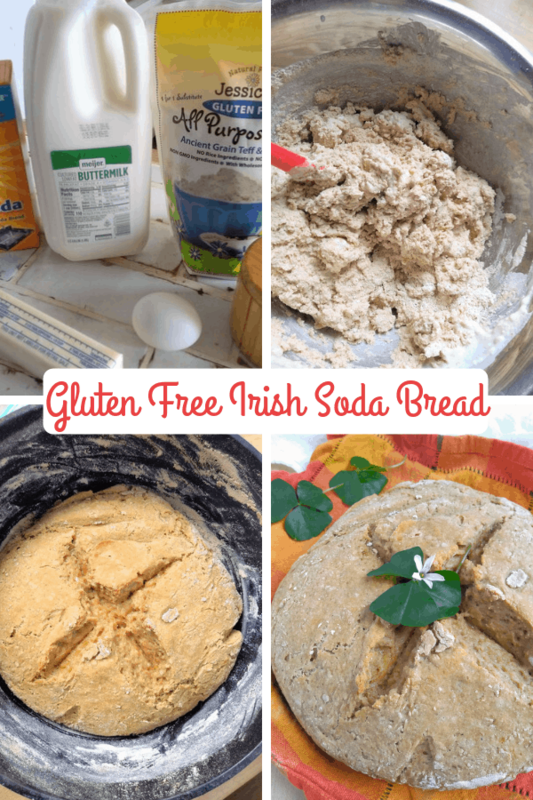 How Can You Make Soda Bread Without Gluten? 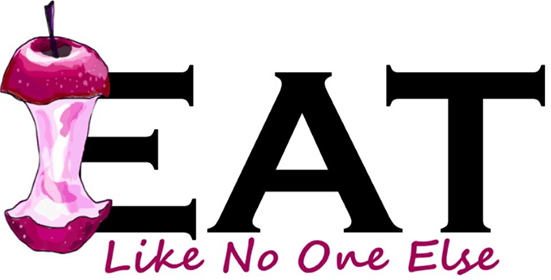 Here is why soda bread can be easily made gluten free. Unlike yeast breads that require the structure that gluten provides, since soda bread is a quick bread that isn’t necessary. When making soda bread, recipes tell you not to overwork the dough. You don’t need to kneed it. Why? Because we don’t want a lot of gluten forming, If we overwork it, the bread will be chewy. That’s fine for a soft pretzel not soda bread. Some soda bread recipes call for pastry or cake flour. Why? Because those flours have less gluten in them. If I am trying to avoid gluten formation when making soda bread, then why not forget the wheat flour all together? I have used this flour cup for cup in any recipe I have used it in that called for all-purpose four. 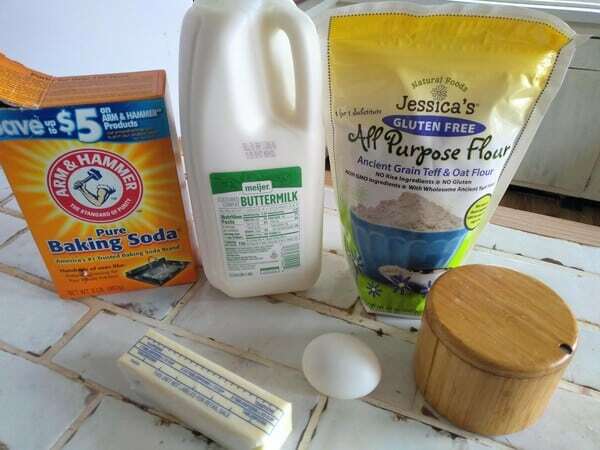 What is in Jessica’s Gluten Free Flour? 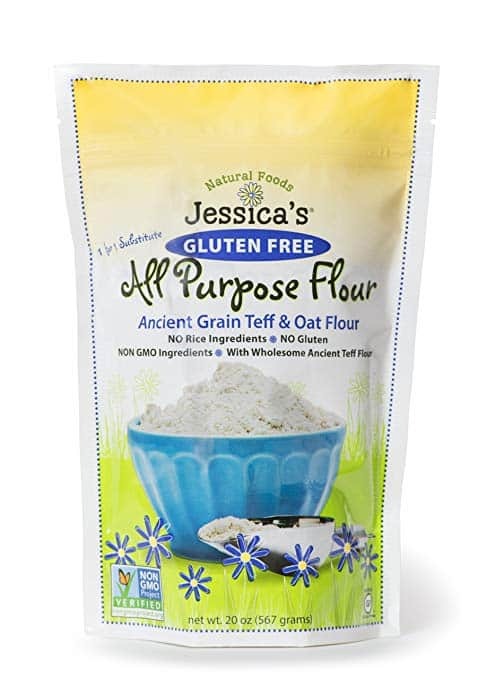 Jessica’s Gluten Free Flour is the best gluten free flour in the world! It’s actually straight up one of the best flour mixes period. Every single thing I have made with this flour has turned out fabulous and better than the wheat version. What does Jessica’s flour contain? Whole grain teff flour, certified gluten-free oat flour, tapioca flour, ground flax seed, and xanthan gum. No rice flour like pretty much every other gluten free blend contains. All of these ingredients come together to add flavor. Flavor that all purpose wheat flour only wishes it could provide. I am not gluten free, neither is anyone in my family. Yet we still love using this flour because it makes whatever we use it in taste better. So imagine how great it is for that person that is missing their old favorite baked goods they had to give up due to a gluten intolerance. You should totally stop reading this and buy some RIGHT NOW! And then come back for the recipe. I love making soda bread in my cast iron dutch oven. It comes out perfect ever time. One rule of thumb I always follow when baking soda bread is baking it in a cast iron dutch oven. Cast iron does really well at evenly distributing and dosing out heat. I find this helps make your loaf more evenly shaped. Why I like using a Dutch oven instead of a skillet is because of the lid. I put the lid on and that traps in the moisture. No this won’t make your bread soggy, it will still have a nice crispy exterior. 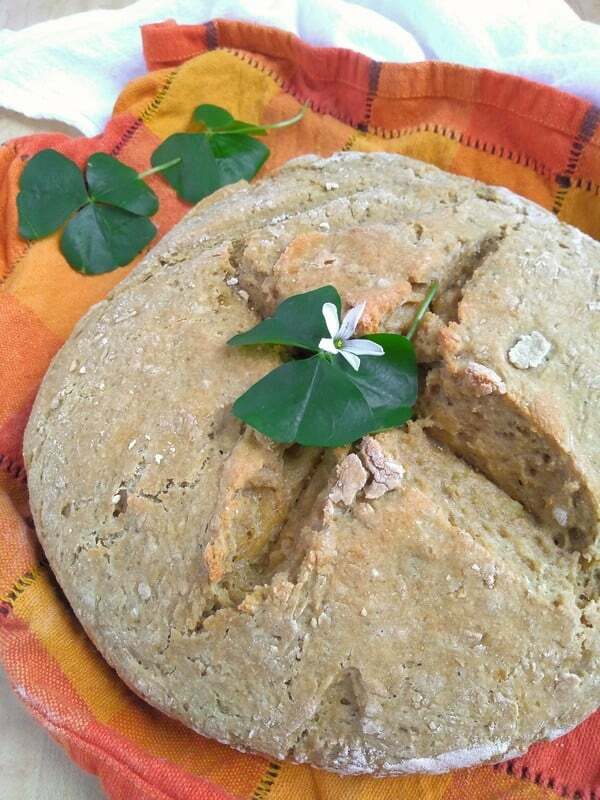 Don’t let those shamrocks in the photo stop you from making this bread any day of the year! Now if that whole flavor thing hasn’t completely sold you on tying this bread yet this will – I have never made a more moist loaf of soda bread EVER! The best ever Irish soda bread, made with gluten free flour. Cube the butter and place in the freezer for a few minutes to keep cold. Preheat your oven to 400 degrees. Put a dusting of flour into your dutch oven and shake with the lid on. Remove the butter from the freezer. With your fingers work the butter into the flour until it resembled a coarse cornmeal. Make a well in the center and add the buttermilk. Fold the dough until the buttermilk is fully Incorporated. Dough will be sticky. Turn the dough onto a floured work surface. Fold the dough instead of kneading until you can form it into a round loaf. 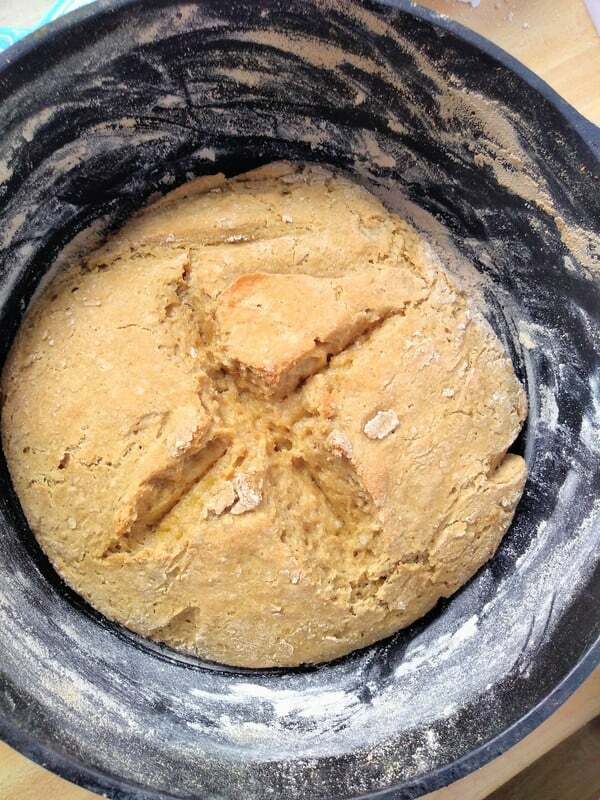 With a knife or pair of kitchen shears, make an “X” shape in the top of the dough. Don’t go down too deep. Place the dough into your dutch oven. Put the lid on and into the oven for 40-45 minutes. The loaf should sound hallow when you tap on it. . Allow to cool with the lid off before removing to a cooling rack. Serve warm. The best way to preserve leftover bread is to wrap it in foil and place in the freezer until you are ready to eat. I wouldn’t recommend leaving the bread out at room temperature as it will dry out fast.